I go to speak at events without commercial or monetary intentions. I primarily go to meet people and share ideas and connect with the Agile communities and Scrum practitioners. On my YouTube channel I have uploaded all recordings of my sessions that are available. In March 2012, at a Scrum.org trainer event, Ken Schwaber checked with me on the possibility of a yearly event about Scrum in the Netherlands. We moved it forward and the first Scrum Day Europe event happened on 11 July of that same year in Amsterdam. My session, “The emergence of the Customer-Oriented Enterprise”, wasn’t recorded, but you can check out my rehearsal of the presentation at the mentioned March trainer event. Find the presentation at Slideshare. Note: At the heart of the concepts presented (2012) is the belief I expressed in my book “Scrum – A Pocket Guide” (2013) and the ideas I am building on again in my “re-vers-ify” narrative (2017). At Capgemini I had already worked with Ken Schwaber on Agile transformation ideas and Scrum at the enterprise level. As I entered Scrum.org as director for the Professional Series in June 2013, that was our first priority to elaborate on. We presented a first set of ideas at the second edition of the Scrum Day Europe event on 4 July 2013 in Amsterdam. We started focusing more on the inspection part of “Agility Path”. We separated it into “Evidence-Based Management (of software)”. The plan was to present it jointly as the opening keynote of Scrum Day Europe 2014. However, as Ken had visum troubles, I presented it alone. I had already written a paper about the core ideas of the concept presented. As ideas keep evolving, I started using the term ‘Empirical Management’ and am tending towards using ‘Exploratory Management’ nowadays. Our focus shifted from organizational transformations back to helping people and teams to employ Scrum. A lot of concerns existed around employing Scrum in the large. Figuring that ‘Scaled Scrum is still Scrum’ we probably ignored the need for too long. We created the Nexus framework, and described it in the Nexus Guide. I presented our approach to Scaled Professional Scrum with the Nexus framework as the opening keynote at Scrum Day Europe 2015. 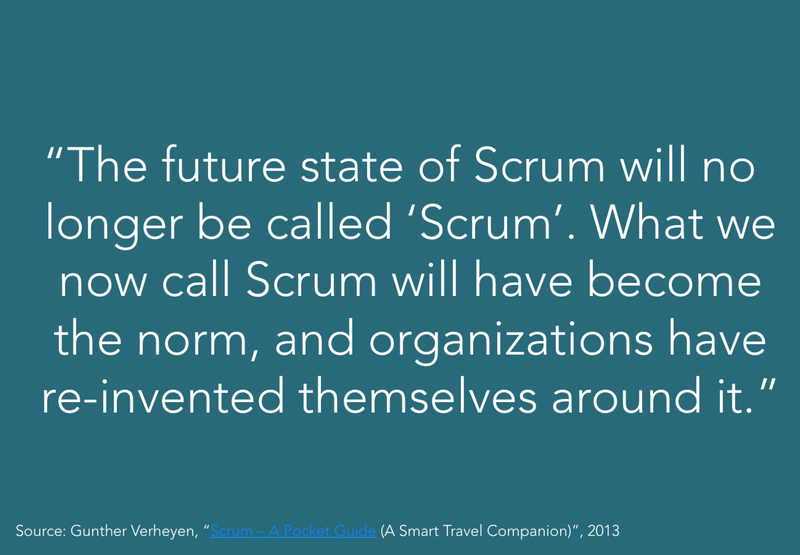 Scrum has been around since 1995. In the spring of 2015, Ken and I discussed how “Done” was a much misunderstood and certainly undervalued purpose of Scrum. Having created some blog notes about it, I used the 21st anniversary of Scrum (2016) to make it my core speaking topic, as “The Future Present of Scrum (Are we Done yet?)”. In 2016 I continued my journey of Scrum as an independent Scrum Caretaker. The opportunity to work with diverse organisations and teams helped me consolidate over a decade of ideas, observations and beliefs of Scrum. I realized that all ideas I had been working on before and -certainly- after 2012 were connected. I created a narrative called “re-vers-ify”, or “re-imagining your Scrum to re-vers-ify your organization”. Too often still the organisational waste, abuse and impediments, ruthlessly highlighted by Scrum, are ignored. Meanwhile organizations grasp for rhythm, focus and simplicity. Re-vers-ify shows a positive path forward, without falsely predicting the end result. It became my speaking topic for 2017. I presented it as the opening keynote at the first ever Scrum Day Ukraine event in Kyiv on 11 March 2017. Since 2003 countless people have told me I limit myself by ‘just’ doing Scrum. After 14 years, still, every day is like my first day of Scrum. Every day again Scrum turns out not a limitation but a gateway to options and possibilities to help people, teams and organizations. Because your readers are clearly interested in all things agile, I thought you might be willing to share with them the news about The 2017 Agile Leadership Summit in Washington, DC on September 22, 2017. This event is for senior leadership, and features an all-lightning-talk format in which seven senior agile leaders will share agile strategies, lessons and learnings with their peers. We certainly welcome you — and your readers — to the event. Will you help us get the word out? http://www.agileCxO.org.